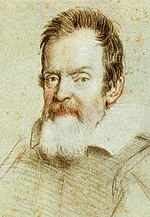 Portrait of Galileo Galilei by Giusto Sustermans. Galileo Galilei (15 February 1564 – 8 January 1642) was an Italian physicist, astronomer, and philosopher who is closely associated with the scientific revolution. His achievements include improvements to the telescope, a variety of astronomical observations, and effective support for Copernicanism. According to Stephen Hawking, Galileo has probably contributed more to the creation of the modern natural sciences than anybody else. He has been referred to as the "father of modern astronomy," as the "father of modern physics", and as the "father of science". The work of Galileo is considered to be a significant break from that of Aristotle. Galileo was born in Pisa, in the Tuscany region of Italy, on February 15, 1564, the son of Vincenzo Galilei. Galileo was their first child out of seven (some people believe six). Most authorities say he was the most talented of the children. Galileo was tutored from a very young age. Later, he attended the University of Pisa but was forced to halt his studies there for financial reasons. However, he was offered a position on its faculty in 1589 and taught mathematics. Soon after, he moved to the University of Padua and served on its faculty, teaching geometry, mechanics, and astronomy until 1610. During this period he concentrated on science, and made many significant discoveries. Although he was a devout Roman Catholic, Galileo fathered three children out of wedlock with Marina Gamba. They had two daughters (Virginia and Livia) and one son (Vincenzio). Because of their illegitimate birth, both girls were sent to the convent of San Matteo in Arcetri at early ages and remained there for the rest of their lives. Virginia took the name Maria Celeste upon entering the convent. She was Galileo's eldest child, the most beloved, and inherited her father's sharp mind. She died on April 2, 1634, and is currently buried with Galileo at the Basilica di Santa Croce di Firenze. Livia (b. 1601) took the name Suor Arcangela, made no great impact on the world, and was ill for most of her life. Vincenzio (b. 1606) was later legitimized and married Sestilia Bocchineri. In 1612, Galileo went to Rome, where he joined the Accademia dei Lincei and observed sunspots. In 1612, opposition arose to the Copernican theories, which Galileo supported. In 1614, from the pulpit of Santa Maria Novella, Father Tommaso Caccini (1574-1648) denounced Galileo's opinions on the motion of the Earth, judging them dangerous and close to heresy. Galileo went to Rome to defend himself against these accusations, but, in 1616, Cardinal Roberto Bellarmino personally handed Galileo an admonition enjoining him to neither advocate nor teach Copernican astronomy as religious doctrine. In 1622, Galileo wrote the The Assayer (Saggiatore), which was approved and published in 1623. In 1624, he developed the first known example of the microscope. In 1630, he returned to Rome to apply for a license to print the Dialogue Concerning the Two Chief World Systems, published in Florence in 1632. In October of that year, however, he was ordered to appear before the Holy Office in Rome. The court issued a sentence of condemnation and forced Galileo to abjure. As a result, he was confined in Siena and eventually, in December 1633, he was allowed to retire to his villa in Arcetri. In 1634, he was deprived of the support of his beloved daughter, Sister Maria Celeste (1600-1634), who died prematurely. In 1638, almost totally blind, Galileo published his final book, Two New Sciences, in Leiden. He died in Arcetri on the January 8, 1642, in the company of his student Vincenzo Viviani. In the pantheon of the scientific revolution, Galileo Galilei takes a high position because of his pioneering use of quantitative experiments with results analyzed mathematically. There was no tradition of such methods in European thought at that time; the great experimentalist who immediately preceded Galileo, William Gilbert, did not use a quantitative approach. However, Galileo's father, Vincenzo Galilei, a lutenist and music theorist, had performed experiments in which he discovered what may be the oldest known non-linear relation in physics, between the tension and the pitch of a stretched string. These observations were in the Pythagorean tradition of music, well-known to instrument makers, that whole-number mathematical relationships define harmonious (pleasing) scales. Thus, a limited form of mathematics had long made its way into physical science at the point of music, and young Galileo was in a position to see his own father's observations generalize that relationship still further. Galileo himself would find credit as the first to plainly state that the laws of nature are mathematical, and (as he said) the idea that "the language of God is mathematics." This was a sharp break with earlier traditions of science: up until this point, following Aristotle, logic, not mathematics had been seen to be the basic intellectual tool of science. Galileo also contributed to the rejection of blind allegiance to authority (like the Church) or other thinkers (such as Aristotle) in matters of science and to the separation of science from philosophy or religion. These are the primary justifications for his description as the "father of science". In the 20th century some authorities, in particular the distinguished French historian of science Alexandre Koyré, challenged the validity of Galileo's experiments. The experiments reported in Two New Sciences to determine the law of acceleration of falling bodies, for instance, required accurate measurements of time, which appeared to be impossible with the technology of the 1600s. According to Koyré, the law was arrived at deductively, and the experiments were merely illustrative thought experiments. Later research, however, has validated the experiments. The experiments on falling bodies (actually rolling balls) were replicated using the methods described by Galileo (Settle, 1961), and the precision of the results were consistent with Galileo's report. 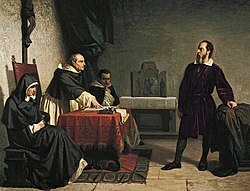 Later research into Galileo's unpublished working papers from as early as 1604 clearly showed the validity of the experiments and even indicated the particular results that led to the time-squared law (Drake, 1973). He had even attempted to measure the speed of light. He did it in an ingenious way. He climbed up a hill and told someone else to climb up another hill. They both had lanterns with shutters. He then opened the shutter of his lantern and counted to see how long it took for the other person to open theirs. Using mathematics, he tried to work out how fast the light was travelling. But when he tried to repeat the experiment with hills further apart, he still got the same time lapse. This was because he was measuring the reaction time of the person. He understood the mathematical parabola, both in terms of conic sections and in terms of the square-law. He recognized that his experimental data would never agree exactly with any theoretical or mathematical form, because of the imprecision of measurement, irreducible friction, and other factors. Due to the merit of his works, Einstein called Galileo the "father of modern science". The belief that Galileo invented the telescope is a common misconception. However, he improved the device, was one of the first to use it to observe the sky, and for a time was one of very few people able to construct one good enough for that purpose. Based only on sketchy descriptions of the telescope, invented in the Netherlands in 1608, Galileo made one with about 3x magnification, and then made improved models up to about 32x. On August 25, 1609, he demonstrated his first telescope to Venetian lawmakers. His work on the device also made for a profitable sideline with merchants who found it useful for their shipping businesses. He published his initial telescopic astronomical observations in March 1610 in a short treatise entitled Sidereus Nuncius (Starry Messenger). It was on this page that Galileo first noted an observation of the moons of Jupiter. This observation upset the notion that all celestial bodies must revolve around the Earth. Galileo published a full description in Sidereus Nuncius in March 1610. In the week of January 7, 1610 Galileo discovered three of Jupiter's four largest satellites (moons): Io, Europa, and Callisto. He discovered Ganymede four nights later. He noted that the moons would appear and disappear periodically, an observation which he attributed to their movement behind Jupiter, and concluded that they were orbiting the planet. He made additional observations of them in 1620. Later astronomers overruled Galileo's naming of these objects, changing his originally named Medicean stars (after his patrons, the Medici) to Galilean satellites. The demonstration that a planet had smaller planets orbiting it was problematic for the orderly, comprehensive picture of the geocentric model of the universe, in which everything circled around the Earth. From September 1610 Galileo observed that Venus exhibited a full set of phases similar to that of the Moon. The heliocentric model of the solar system developed by Copernicus predicted that all phases would be visible since the orbit of Venus around the Sun would cause its illuminated hemisphere to face the Earth when it was on the opposite side of the Sun and to face away from the Earth when it was on the Earth-side of the Sun. In contrast, the geocentric model of Ptolemy predicted that only crescent and new phases would be seen, since Venus was thought to remain between the Sun and Earth during its orbit around the Earth. Galileo's observations of the phases of Venus proved that it orbited the Sun and lent support to (but did not prove) the heliocentric model. Galileo was one of the first Europeans to observe sunspots. He also reinterpreted a sunspot observation from the time of Charlemagne, which formerly had been attributed (impossibly) to a transit of Mercury. The very existence of sunspots showed another difficulty with the unchanging perfection of the heavens as assumed in the older philosophy. And the annual variations in their motions, first noticed by Francesco Sizi, presented great difficulties for both the geocentric system and that of Tycho Brahe. A dispute over priority in the discovery of sunspots led Galileo to a long and bitter feud with Christoph Scheiner; in fact, there is little doubt that both of them were beaten by David Fabricius and his son Johannes. Galileo was also the first to report lunar mountains and craters, whose existence he deduced from the patterns of light and shadow on the Moon's surface. He even estimated the mountains' heights from these observations. This led him to the conclusion that the Moon was "rough and uneven, and just like the surface of the Earth itself," rather than a perfect sphere as Aristotle had claimed. Galileo observed the Milky Way, previously believed to be nebulous, and found it to be a multitude of stars packed so densely that they appeared to be clouds from Earth. He also located many other stars too distant to be visible with the naked eye. Galileo observed the planet Neptune in 1612, but did not realize that it was a planet and took no particular notice of it. It appears in his notebooks as one of many unremarkable dim stars. Galileo never accepted Kepler's elliptical orbits of the planets, despite Kepler's tremendous amount of data collected by Tycho Brahe, considering the circle a "perfect" shape. While the Copernican theory used epicycles to account for the variations, which added a great deal of complexity, Kepler's model did not. Galileo attributed tides to momentum, as opposed to Kepler's theories which used the moon as a cause. (Neither of these great scientists, however, had a workable physical theory of tides; this had to wait for the work of Newton.) Galileo stated in his Dialogue that, if the Earth spins on its axis and is travelling at a certain speed around the Sun, parts of the Earth must travel "faster" at night and "slower" during the day. If this theory were correct, there would be only one high tide per day at noon. Galileo and his contemporaries were aware of this inadequacy because there are two daily high tides at Venice instead of one, and they travel around the clock. But Galileo dismissed this anomaly as the result of several secondary causes, including the shape of the sea, its depth, and other things. Against the assertion that Galileo was deceptive in making these arguments, Albert Einstein developed the opinion that Galileo developed his "fascinating arguments" and accepted them uncritically out of a desire for physical proof of the motion of the Earth (Einstein, 1952). The noted author Arthur Koestler, in his book 'The Sleepwalkers', argued that Galileo was grossly unscientific and dishonest in his methods, and rarely gave credit where due. Others argue that it is unfair to hold him to modern "scientific standards" (mathematical theory supported by evidential trial) with which he himself was only beginning to experiment. By the standards of his own time, Galileo was often willing to change his views in accordance with observation. It may also be argued that all modern scientists (not to mention other professionals) filter their observations and beliefs through pre-conceived notions. Although this may appear "dishonest", some of it is actually required for the scientific process to function (see Bayes theorem). Galileo's perceived dishonesty, then, is not abnormal. Galileo's theoretical and experimental work on the motions of bodies, along with the largely independent work of Kepler and René Descartes, was a precursor of the Classical mechanics developed by Sir Isaac Newton. He was a pioneer, at least in the European tradition, in performing rigorous experiments and insisting on a mathematical description of the laws of nature. One of the most famous stories about Galileo is that he dropped balls of different masses from the Leaning Tower of Pisa to demonstrate that their time of descent was independent of their mass (excluding the limited effect of air resistance). This was contrary to what Aristotle had taught: that heavy objects fall faster than lighter ones, in direct proportion to weight. Though the story of the tower first appeared in a biography by Galileo's pupil Vincenzo Viviani, it is not now generally accepted as true. Moreover, Giambattista Benedetti had reached the same scientific conclusion years before, in 1553. However, Galileo did perform experiments involving rolling balls down inclined planes, one of which is in Florence, called the bell and ball experiment, which proved the same thing: falling or rolling objects (rolling is a slower version of falling, as long as the distribution of mass in the objects is the same) are accelerated independently of their mass. (Although Galileo was the first person to demonstrate this via experiment, he was not — contrary to popular belief — the first to argue that it was true. John Philoponus had argued this centuries earlier: see also the Oxford Calculators). He determined the correct mathematical law for acceleration: the total distance covered, starting from rest, is proportional to the square of the time ( ). He expressed this law using geometrical constructions and mathematically-precise words, adhering to the standards of the day. (It remained for others to re-express the law in algebraic terms.) He also concluded that objects retain their velocity unless a force — often friction — acts upon them, refuting the generally accepted Aristotelian hypothesis that objects "naturally" slow down and stop unless a force acts upon them (again this was not a new idea: Ibn al-Haitham had proposed it centuries earlier, as had Jean Buridan, and according to Joseph Needham, Mo Tzu had proposed it centuries before either of them, but this was the first time that it had been mathematically expressed). Galileo's Principle of Inertia stated: "A body moving on a level surface will continue in the same direction at constant speed unless disturbed." This principle was incorporated into Newton's laws of motion (first law). In the early 1600s, Galileo and an assistant tried to measure the speed of light. They stood on different hilltops, each holding a shuttered lantern. Galileo would open his shutter, and, as soon as his assistant saw the flash, he would open his shutter. At a distance of less than a mile, Galileo could detect no delay in the round-trip time greater than when he and the assistant were only a few yards apart. While he could reach no conclusion on whether light propagated instantaneously, he recognized that the distance between the hilltops was perhaps too small for a good measurement. Galileo is lesser known for, yet still credited with being one of the first to understand sound frequency. After scraping a chisel at different speeds, he linked the pitch of sound to the spacing of the chisel's skips (frequency). In his 1632 Dialogue Galileo presented a physical theory to account for tides, based on the motion of the Earth. If correct, this would have been a strong argument for the reality of the Earth's motion. (The original title for the book, in fact, described it as a dialogue on the tides; the reference to tides was removed by order of the Inquisition.) His theory gave the first insight into the importance of the shapes of ocean basins in the size and timing of tides; he correctly accounted, for instance, for the negligible tides halfway along the Adriatic Sea compared to those at the ends. As a general account of the cause of tides, however, his theory was a failure. Kepler and others correctly associated the Moon with an influence over the tides, based on empirical data; a proper physical theory of the tides, however, was not available until Newton. Galileo also put forward the basic principle of relativity, that the laws of physics are the same in any system that is moving at a constant speed in a straight line, regardless of its particular speed or direction. Hence, there is no absolute motion or absolute rest. This principle provided the basic framework for Newton's laws of motion and is the infinite speed of light approximation to Einstein's special theory of relativity. Galileo made a few contributions to what we now call technology as distinct from pure physics, and suggested others. This is not the same distinction as made by Aristotle, who would have considered all Galileo's physics as techne or useful knowledge, as opposed to episteme, or philosophical investigation into the causes of things. In 1595–1598, Galileo devised and improved a "Geometric and Military Compass" suitable for use by gunners and surveyors. This expanded on earlier instruments designed by Niccolo Tartaglia and Guidobaldo del Monte. For gunners, it offered, in addition to a new and safer way of elevating cannons accurately, a way of quickly computing the charge of gunpowder for cannonballs of different sizes and materials. As a geometric instrument, it enabled the construction of any regular polygon, computation of the area of any polygon or circular sector, and a variety of other calculations. About 1606–1607 (or possibly earlier), Galileo made a thermometer, using the expansion and contraction of air in a bulb to move water in an attached tube. In 1609, Galileo was among the first to use a refracting telescope as an instrument to observe stars, planets or moons. In 1610, he used a telescope as a compound microscope, and he made improved microscopes in 1623 and after. This appears to be the first clearly documented use of the compound microscope. In 1612, having determined the orbital periods of Jupiter's satellites, Galileo proposed that with sufficiently accurate knowledge of their orbits one could use their positions as a universal clock, and this would make possible the determination of longitude. He worked on this problem from time to time during the remainder of his life; but the practical problems were severe. The method was first successfully applied by Giovanni Domenico Cassini in 1681 and was later used extensively for large land surveys; this method, for example, was used by Lewis and Clark. (For sea navigation, where delicate telescopic observations were more difficult, the longitude problem eventually required development of a practical portable chronometer, such as that of John Harrison). In his last year, when totally blind, he designed an escapement mechanism for a pendulum clock. The first fully operational pendulum clock was made by Christiaan Huygens in the 1650s. He created sketches of various inventions, such as a candle and mirror combination to reflect light throughout a building, an automatic tomato picker, a pocket comb that doubled as an eating utensil, and what appears to be a ballpoint pen. Psalms 93:1; 96:10; 104:5, 1Chronicles 16:30 and Ecclesiastes 1:4,5 speak of the (in some sense) "firm" and "established" position of the earth. Galileo defended heliocentrism, and claimed it was not contrary to those Scripture passages. He took Augustine's position on Scripture: not to take every passage too literally, particularly when the scripture in question is a book of poetry and songs, not a book of instructions or history. The writers of the Scripture wrote from the perspective of the terrestrial world, and from that vantage point the sun does rise and set. In fact, it is the earth's rotation which gives the impression of the sun in motion across the sky. By 1616 the attacks on Galileo had reached a head, and he went to Rome to try to persuade the Church authorities not to ban his ideas. In the end, Cardinal Bellarmine, acting on directives from the Inquisition , delivered him an order not to "hold or defend" the idea that the Earth moves and the Sun stands still at the centre. The decree did not prevent Galileo from hypothesizing heliocentrism. For the next several years Galileo stayed well away from the controversy. He revived his project of writing a book on the subject, encouraged by the election of Cardinal Barberini as Pope Urban VIII in 1623. Barberini was a friend and admirer of Galileo, and had opposed the condemnation of Galileo in 1616. The book, Dialogue Concerning the Two Chief World Systems, was published in 1632, with formal authorization from the Inquisition and papal permission. Pope Urban VIII personally asked Galileo to give arguments for and against heliocentrism in the book, and to be careful not to advocate heliocentrism. He made another request, that his own views on the matter be included in Galileo's book. Only the latter of those requests was fulfilled by Galileo. Whether unknowingly or deliberate, Simplicius, the defender of the Aristotelian Geocentric view in Dialogue Concerning the Two Chief World Systems, was often caught in his own errors and sometimes came across as a fool. This fact made Dialogue Concerning the Two Chief World Systems appear as an advocacy book; an attack on Aristotelian geocentrism and defense of the Copernican theory. To add insult to injury, Galileo put the words of Pope Urban VIII into the mouth of Simplicius. Most historians agree Galileo did not act out of malice and felt blindsided by the reaction to his book. However, the Pope did not take the public ridicule lightly, nor the blatant bias. Galileo had alienated one of his biggest and most powerful supporters, the Pope, and was called to Rome to explain himself. Galileo was required to recant his heliocentric ideas; the idea that the Sun is stationary was condemned as "formally heretical". His offending Dialogue was banned; and in an action not announced at the trial and not enforced, publication of any of his works was forbidden, including any he might write in the future. After a period with the friendly Ascanio Piccolomini (the Archbishop of Siena), Galileo was allowed to return to his villa at Arcetri near Florence, where he spent the remainder of his life under house arrest, dying on January 8, 1642. It was while Galileo was under house arrest when he dedicated his time to one of his finest works, Two New Sciences. This book has received high praise from both Sir Isaac Newton and Albert Einstein. As a result of this work, Galileo is often called, the "father of modern physics". Galileo was reburied on sacred ground at Santa Croce in 1737. He was formally rehabilitated in 1741, when Pope Benedict XIV authorized the publication of Galileo's complete scientific works (a censored edition had been published in 1718), and in 1758 the general prohibition against heliocentrism was removed from the Index Librorum Prohibitorum. On 31 October 1992, Pope John Paul II expressed regret for how the Galileo affair was handled, as the result of a study conducted by the Pontifical Council for Culture. In modern scientific terms, we consider Galileo's views on heliocentricity to be no fundamental advance. Most of his discoveries were only further advances of Copernicus' views. The heliocenticity model that Galileo presented was no more accurate than the Tychonic system model, the main competing theory at the time. Stellar parallax, the first evidence from outside the solar system that the Earth does indeed move, would not be observed until 1838 (Consolmagno 150-152). Today, we know the Sun is no more the centre of the universe than the Earth is, as it has its own orbit in the Milky Way Galaxy, just like the Galilean moons of Jupiter have orbits around Jupiter while Jupiter orbits the Sun. He found this because he realized that the only orbit the moons could follow is that which orbits behind Jupiter. Galileo, a pop song by the Indigo Girls. Galileo is mentioned in Queen's song "Bohemian Rhapsody"
Biagioli, Mario (1993). Galileo, Courtier: The Practice of Science in the Culture of Absolutism. Chicago: University of Chicago Press. Consolmagno, Guy; Schaefer, Marta (1994). Worlds Apart, A Textbook in Planetary Science. Englewood, New Jersey: Prentice-Hall, Inc. ISBN 0-13-964131-9. Col, Joël (2003), Entre Galilée et l'Eglise: la Bible. Une mise au point. Etude. ISBN 2-9520299-0-3. AutoEdition Méguila. Drake, Stillman (1953). Dialogue Concerning the Two Chief World Systems. Berkeley: University of California Press. Lessl, Thomas, "The Galileo Legend". New Oxford Review, 27-33 (June 2000). Newall, Paula (2004). "The Galileo Affair." Remmert, Volker R. (2005). Galileo, God, and Mathematics. In: Bergmans, Luc/Koetsier, Teun (eds. ): Mathematics and the Divine. A Historical Study, Amsterdam et al., 347-360.